J told me he had discovered a Thai eatery around the SMU area which served awesome Thai food at really cheap prices but he couldn’t recall the name of the place. So a list of possible eateries immediately popped into mind. Perhaps it was Yhingthai Palace, Bumbu Restaurant, Tom Yam Kungfu or Ah loy Thai? All of which were part of my supposedly comprehensive to-go list? 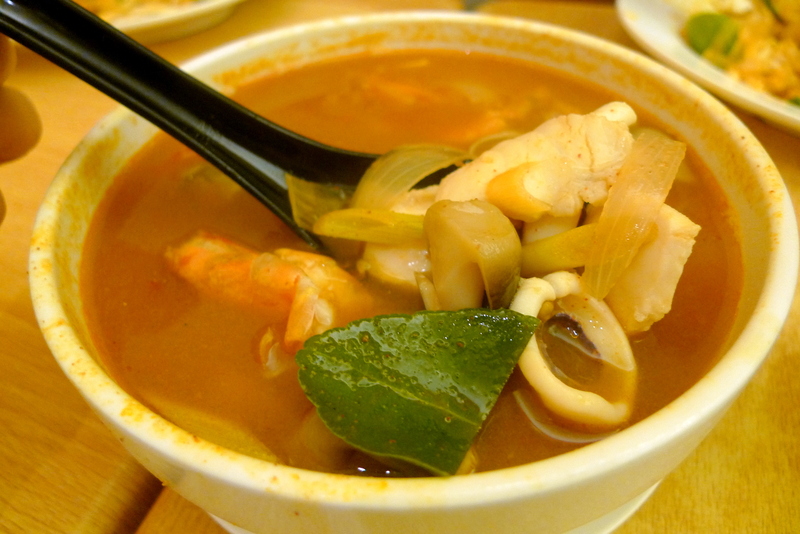 To my surprise, it happened to be an eatery totally foreign to me – Aroy Dee at Bencoolen Street. Aroy Dee’s menu is both comprehensive and cheap, with a range from poultry to seafood and really resembles an affordable zi char cafe. When I was here on a weekday night, the cafe was full so service was a bit sluggish. Thai Tea($1.80) was a great way to cool down after the walk from SMU. I didn’t feel that the Phad Thai($4 for Pork/$5 for Seafood) was deserving of J’s rave reviews, simply because it wasn’t tasty enough. Thai flavours are meant to be sharp and strong, but this was one mild tasting Phad Thai with a noodle texture which I found too dry and sticky. Thai Express does a better job. 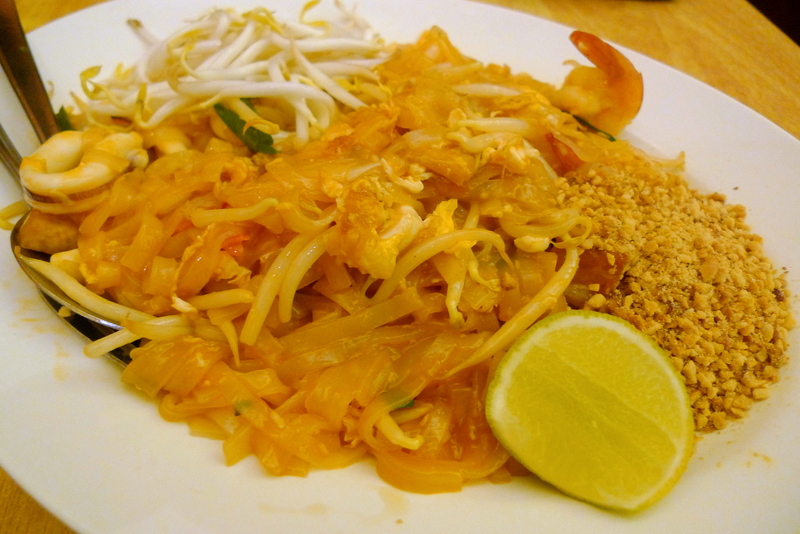 1 good point I can say though is that they didn’t scrimp on the ingredients since I found 7 shrimps in my Phad Thai. I’m not a fan of Tom Yam Goong($6) because I can’t really take much spicy food but this Tom Yam Soup was nothing noteworthy anyway. 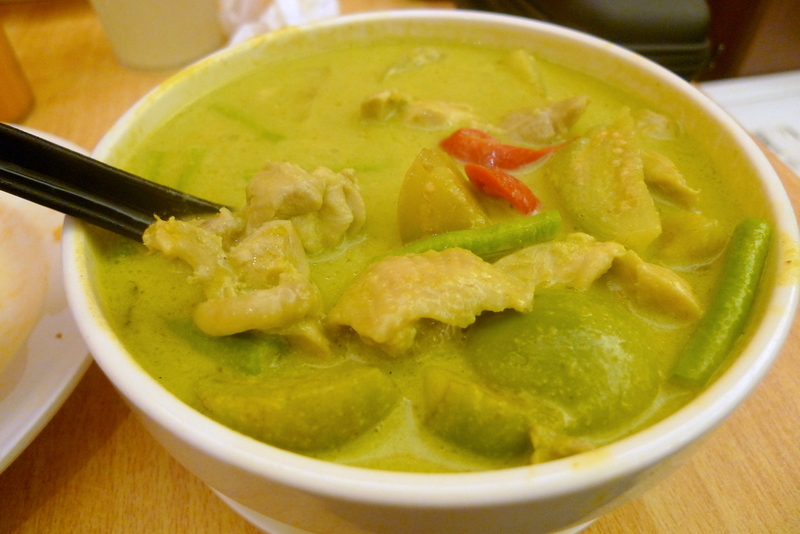 Having been spoilt by the Green Curry I had at Nu Thai (Probably one of the Best Thai Restaurants in Adelaide), I found the Green Curry Chicken($6) here much too watery and the chicken meat too tough. While the food here isn’t spectacular, at least it’s cheap right? its at sunshin plaza right! its so near the shop that i go to this thai place at least twice a week. yea correct! But you must try Ah Loy Thai opposite Suntec City. Totally whoops Aroy Dee and also round the same price!